A remarkable and delightful book that shows how children are alike the world over, while at the same time celebrating the rich and interesting diversity of their ordinary lives. Vivid and colourful pictures emphasise the many similarities in two boys’ lives despite the great differences in culture and environment. 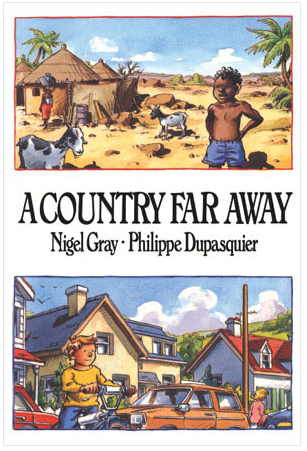 Nigel Gray and Philippe Dupasquier have collaborated to create a unique book that will encourage an awareness and understanding of other children’s lives. Each kid’s life seems far more interesting and exciting than the other’s. Author and illustrator make a great team. Nigel Gray was born in a farm shed in Ireland to two teenagers, neither of whom had known their parents, and in my father's case who didn't even know his name. My mother was a kitchen maid, my father a farm servant. They had three unwanted babies in three years. At twelve months old, during the Second World War, I was taken to England. I never saw my father again. Nor the brother and sister. I went into a series of foster homes, a children's home, and later to live with my mother. They were not the best of times.